Most of you following this blog know that I was at Galacticon 3 and ComicPalooza last weekend. I had a great time, though I would argue that one of the difficulties with attending such a large combined convention is that you have to pick and choose what events/panels/presentations you will attend. There were over 20 K attendees when all was said and done. The Convention Center was enormous–a regular rabbit warren of rooms and lecture halls. The venue also held an upscale lawyer’s graduation in the middle of all the sci-fi chaos (I wonder if any heads will roll over *that* bit of planning) and at times, it looked like a cartoonish clash of families at a wedding with the lawyer types in their $2 K outfits looking down their noses at the sci-fi fans and *their* $2 K outfits! I wouldn’t be at all surprised if some of the lawyers crowd had really wanted to be at the sci-fi convention–we looked like we were having more fun! I wish I had worried less about my joint presentations (they went well, mostly due to Anna Butler’s superb organizational skills!) and had taken the time to sit in on some of the panels. I wish I’d taken charge of my time better–that I had not run hither and hon but had said, “I want to be here and do this” and just did it. I wish I’d brought a better camera, and had packed the video camera anyway. I wish I’d spent less money on food (though it was hard, darn it, everything was so bloody expensive in Houston!) and more on autographs, photo ops, or merchandise. I had my reasons. I was trying to be good, trying to stay within the budget. I have quarterly taxes due this month. I have a filling that’s suspiciously painful. The laptop is locking up more and giving me the Blue Screen of Death and I don’t know how many more times the Lt. Colonel John Sheppard School of Computer repair will work (i.e. turn it off and back on again). I told myself I didn’t need to stand in line and be one of many telling an actor or actress how much I appreciated their work. How the character they represented gave me the strength or courage to be a better person. I wish I’d followed my inner rebel and had, at the very least, determined to sit in on the panel given by Sir Patrick Stewart instead of following the schedule I’d been given. Because sometimes when you stray from the path laid out for you–that’s when amazing things happen. I found out later exactly what I’d missed. 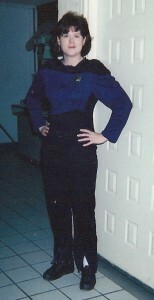 My love of sci-fi isn’t limited to Star Trek by any means. Babylon 5, Stargate SG-1 and Stargate Atlantis all top the list of shows I can watch over and over again. In part because of the unapologetic strong role models for women. In part because there was a sense of ‘team’ among these shows, and it made you as the viewer strive to be good enough (at whatever you did) to be considered part of that team. I get that the actor is not the character. I can separate the two in my mind, which is helpful when you love a character and the actor may or may not be someone of similar character strength. That is why it’s called acting after all. But even though I can maintain that distance, it makes me feel all warm and fuzzy inside when a celebrity whose work I admire turns out to be admirable in other respects as well. It somehow validates your love of that character just a little. This past week, I’ve seen a photo in which John Barrowman, on meeting a young blind girl, took her hands and placed them on his face, guiding her to his hair, his eyes, his lips, his cheekbones so that she could ‘see’ him. The picture is blurry but you can see the genuine patience and understanding on his face–this is something that he wanted to do. And though I frequently joke about how everyone loves John Barrowman and wants to kiss him, well, after this, I think it might be true. But the showstopper for me is the Q&A that I missed, the one with Sir Patrick Stewart. Today, the internet is abuzz with what happened there. I’m going to give you the links from both sides of the story–from viewers and the person who asked the question as well. They can tell the story much better than I can because they were there and I was not. A member of the audience asked Sir Patrick Stewart what was the achievement he was the most proud of outside his acting career. He answered by saying it was his efforts to call attention to domestic violence against women. What happens next–well, you’ll have to watch and read it to get the full effect. First the video in which Sir Patrick answers the question, stating it is in men’s hands to stop violence against women. His powerful, thoughtful, insightful words are ones everyone should hear. I defy you to watch it without tearing up. Can I say that the fact that the woman in the audience was wearing a Next Gen uniform makes me recognize a kindred spirit? Someone who uses the worlds she reads about and watches on television and in the movies to make her life better. Stronger. Healthier. A Trill at that. If you know anything about Star Trek, you’ll recognize that co-joined species as one that experiences many lives in a symbiotic state with its host–and how symbolic that is, whether the questioner realizes it or not. Next, we have the woman who asked the question and her response to that emotional moment (taken from from her Tumblr account). I’m so glad there was someone taking pictures as well as videoing this experience. It’s a powerful one that needs to be shared. I’m so glad that Lemon Sweetie had the nerve to stand up and ask her question, and to get the answer and connection she needed and deserved. And the standing ovations! So I think it would be an understatement to say that I regret not sitting in on that Q&A panel. The take-home lesson from that is this: sometimes you need to trust your instincts. Sometimes you need to say, “what the hell, it’s a once-in-a lifetime experience”. Because finding out a fandom hero is a real-life hero? Priceless. As an FYI, the Summer Sizzling Reads starts today and lasts the entire month of June! 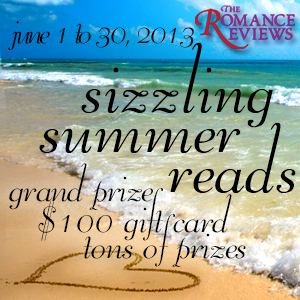 Be sure to register at The Romance Reader to be entered to win tons of prizes all month long! My Q&A will be up June 3–if you don’t know the answer, come check out the website–I’ll post it here. Answering the question on TRR site will enter you to win a copy of The Boys of Summer! This entry was posted in Uncategorized and tagged ComicPalooza, domestic violence, equal rights, heroes, life balance, Patrick Stewart, Sarah Madison by Sarah Madison. Bookmark the permalink. He is awesome. Several years ago I read an interview where he talked about how for many years he wouldn’t do any violent roles, because he was terrified his anger for his father and past would take over, and he would lose himself. It was only after a stage director he trusted promised that he, the director, wouldn’t allow that to happen, did he finally do such a role. I wish I could find that interview. I fell in love with him for that. Turning down work and complex characters just because he never wanted to become violent, like his father, and was afraid that would happen to him. Wow, I didn’t know that about him–thank you for sharing it with me. I can understand where his concern comes from though. I did a lot of theater in high school and college and certain roles do sort of grab you and threaten to pull you under if you aren’t careful. That video made me tear up. I’m trying not to cry, because I’m not alone in this room. What a beautiful man, what a brave woman. I know! That was pretty much my reaction too! And then I could kick myself for missing a once in a lifetime event. Ironically, I would have appreciated and enjoyed the video more had I simply come across it online–the fact that I was there and *missed* it, feels like a dope-slap moment for me. Truthfully, had I been there in the actual room, I wouldn’t have had as good a ‘seat’ as we do online. I would have been a part of the moment, but I’d have still had to see it online to get the full effect! You said it best here: What a beautiful man, what a brave woman. I’m sorry you missed the event, bb! I hope you had a good time, despite missing it. Conventions are so much fun – the atmosphere, the experience in total…you can’t do everything, and sometimes sacrifices must be made! At least there’s video? It definitely should have been shared with the world! 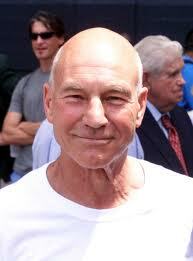 Patrick Stewart has a lot of influence, and it would be great if he reached at least one person.